The pearls of Tahiti are sorted according to an official classification which takes into account their shape and size as well as how many surface imperfections there are, and where they appear. There are also more subtle criteria like brilliance and shine. - Round : An almost perfect sphere with a maximum of 2% variation in the diameter. These are the rarest and the most expensive pearls. - Semi-Round (Or Near-Round) : A spherical pearl with a variation in diameter if between 2% and 5%. These pearls, once mounted, appear to be round, but due to their imperfection can be bought at a cheaper price. - Semi-Baroque : Pearls shaped like a tear-drop, a pear, an oval or a button. The diameter varies more than 5%, but the pearls are symmetrical and often mounted as pendants. - Baroque : Pearls that have no definite shape (irregular), are asymmetrical and therefore not in the above categories. - Circled : Pearls having one or more concentric rings. The criteria for the surface quality consist of 2 characteristics : the perfection of the surface and its sheen. The quality can be recognized by the naked eye. The surface quality can be judged by diverse imperfections such as facets, bumps, stripes, curls, grooves, organic deposits, swellings, growths, or milky discolored spots. The luster, or shine, refers to the more or less perfect reflexion of light on the surface of the pearl. It depends on the regularity, the thickness and the arrangement of the layers of mother-of-pearl. A beautiful luster is the result of a total reflexion of light which gives a mirror-like effect. A pearl without luster has a dull look. - Category A : A pearl having at most one imperfection or a group of slight imperfections concentrated on a maximum of 10% of its surface. A beautiful luster. - Category B : A pearl with slight imperfections concentrated on a maximum of 30% of its surface. Beautiful to medium luster. - Category C : A pearl with slight imperfections concentrated on a maximum of 60% of its surface. Medium luster. - Category D : A pearl having either slight imperfections over more than 60% of its surface, or slight and more serious imperfections on a maximum of 60% of its surface. Dull luster. The positive sign (+) indicate a pearl with a very b color and a very good shiny/luster. Because each pearl is unique, the jeweler’s job is to mask the flaws. To do this, he can cover them with the setting (Cat. A) and make sure the flawed side is hidden when the pearl is being worn (Cat. B and C). In this way the flaws are unseen on mounted pearls, except for category D pearls. 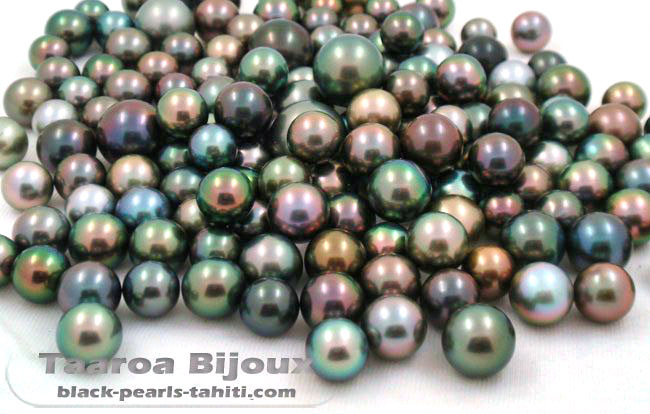 In addition to their color, it\'s the size which differentiates the pearls of Tahiti from the white pearls of Asia. They are measured at their diameter, at their widest part for Semi-Baroque pearls. The smallest have a diameter of 8 mm. The medium size is around 11.5 mm. Those pearls larger than 12 mm are the rarest, and are very small percentage of the harvest. Pearls over 14 mm are exceptional, and those of high quality are especially sought after. The commercial name is deceiving, as the "Black Tahitian Pearls" are far from being all black. To the contrary, the colors range from the purest white to the deepest black, passing through every shade of silver, peacock greens, eggplant purple, golden browns and even rainbows. These colors are natural, and vary according to the original graft made at the same time the nucleus is inserted, and also to the farming techniques and the lagoon. The color is not a criterion of quality, and each person may choose according to their taste. To give you the best information I use a color chart to find the precise color of each pearl. The letter (c, r or e) after the color indicate the rarity of the color of the pearl : c = classic, r = rare, e=exceptional.